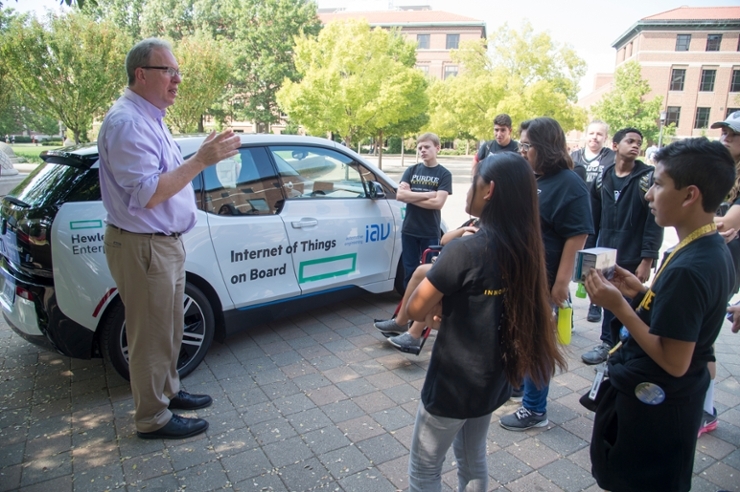 Students from Purdue Polytechnic High School in Indianapolis visit the HPE Connected Car while attending the 2017 Dawn or Doom Conference at Purdue. When high school students from Danville, Illinois, began studying the high number of traffic accidents along their local stretch of interstate, they knew they needed to think broadly about the topic. A trip to Purdue’s Dawn or Doom conference gave them insight they needed. Dawn or Doom – Purdue’s annual conference that looks at the promise and pitfalls of emerging technology – has become a major campus event with renowned speakers discussing everything from the rise of artificial intelligence to the future of genetically modified food. But the conference has also become a chance to expose high school students to topics not typically covered in their curriculum, allowing them to interact with professors and professionals. In 2017, more than 5,500 middle and high school students participated in the Dawn or Doom conference, either by attending in person or virtually, watching via live video feed or participating in College of Agriculture’s virtual field trip program, zipTrips. Woods said her students, many who participate in the school’s Future Problem Solvers program, were impacted by Dawn or Doom long after the conference ended. Visits to hands-on exhibits, like the virtual reality technology in Purdue’s Envision Center and the HPE Connected Car, along with the visual-note taking by Ink Factory’s graphic artists, have greatly influenced student projects. For Andrew Zeller’s students at Purdue Polytechnic High School in Indianapolis, the trip to the Dawn or Doom conference came as a prize for winning a school-wide design contest. He said students loved the hands-on tech, and being able to listen to presentations by people like Robb Fraley, the chief technology officer for Monsanto. But the bigger prize for students was the insight they received about how the things they are learning in school have real world applications. “It gave them the validation that what we do in school is real, and that what we’re doing is preparing them to take those next steps,” Zeller says. That same insight is why Miguel Rosales, a computer science teacher at Attica High School in Indiana, has brought students to the conference for the past three years. For Cindy Aubuchon, an English teacher at McCutcheon High School in Lafayette, the Dawn or Doom conference represented an opportunity to expose over 200 students to a college campus and to give them a glimpse of the opportunities it can provide – everything from interacting with famous authors to operating virtual reality technology. To learn more about Dawn or Doom ’18, to be held Nov. 5-6 on Purdue’s West Lafayette campus, and how high school students and other school groups can attend, contact Diana Hancock at hancockd@purdue.edu.